There's a popular shift occurring within the film community. Audiences are getting tired of CGI. Blockbusters are built around special effects, but nobody's doing anything new with the technology anymore. Nobody, that is, except for Matt Reeves. Dawn of the Planet of the Apes pushes the boundaries of what we think computer animation is capable of in live action films and opens a new realm of possibilities for modern cinema. Lord of the Rings had a sympathetic motion-capture performance in a supporting role? Forget that. Dawn puts the motion capture in the front seat. Main character. Begin and end on a tight close up of his face. And he's not only passable, he's the most emotionally resonant character in the whole movie. Of course, part of the reason this works is that the film puts character first. It never lets being a big budget sci-fi/action movie stop it from having a compelling story. It's been several years since the events of the previous film, and while the smart simians flourish in the forest, the human population is in crisis. The few survivors that remain are running out of power, and the only renewable energy source resides within the apes' dominion. The two races must work together in this allegorical apartheid, and as they come closer together a natural dualism emerges on both sides. Caesar and Malcolm are benevolent and charismatic leaders, concerned with protecting their family and assisting their community; but Koba and Carver are wary of working with their mortal enemies, and their distrust fuels violent unrest. And it's not just the characters that look great. Matt Reeves might put character first, but he never neglects the big action set pieces. There's primate infiltration and espionage. There's monkeys riding horses and dual-wielding machine guns. There's a tank. And from that tank, there's a breath-taking panoramic long shot which surveys the chaotic carnage of combat—and which, after a moment's reflection, you realize is all computer generated. But instead of feeling inert or vacuous, the animation gives the image new life, delivering visuals which are striking because of their artificial origins, rather than in spite of them. Instead of using it as a crutch to carry the action along, the animation is used as a means to create the perfect shot (and Reeves seems to be trying to make up for the erratic cinematography of Cloverfield with more than one elegant steadicam track). At this point I have to admit that I've been playing pretty close to the chest, so let me put all my cards on the table. I always do my best to go into new films as blind as possible, but in this case I failed. As with The Place Beyond the Pines, I went into Dawn of the Planet of the Apes with high expectations, and as a result I came out slightly disappointed. It's not that I disliked the film—it's still one of my favorite of this year's blockbusters—but there were a few too many bland or frustrating elements for me to count it among the year's best overall. What bothered me most was how forcefully telegraphed both of the antagonists were. Neither Koba nor Carver ever has a chance to become sympathetic. 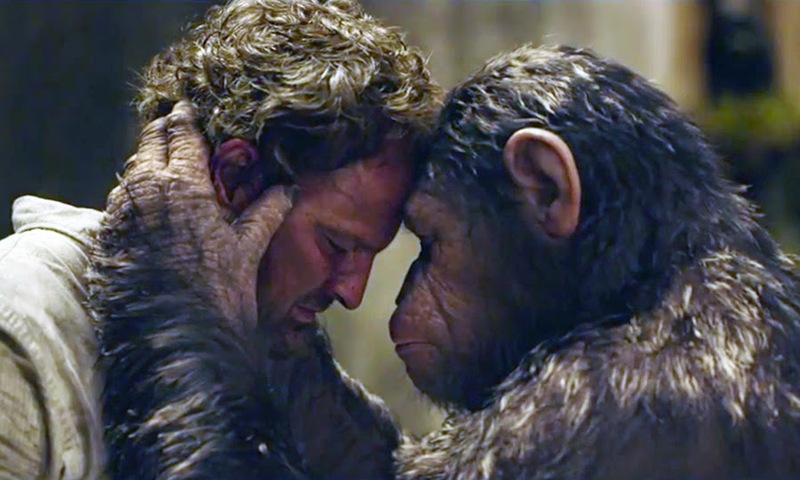 They both get a single throwaway line to explain their position—Koba shows the results of "human work" and Carver talks about hating the apes because they "killed half the planet"—but these moments are the exception that proves the rule. The antagonists are too one-sided: they're both violent, cruel, unsympathetic racists. They may as well have mustaches to twirl. Their characters touch on difficult subject matter (race relations and bipartisan cooperation), but rather than face them head-on the film makes them simple and easy to hate. Caricatured villains only work when the tone is light, and Dawn takes itself seriously from start to finish. As a result, the simplicity of the villains negates the complexity of the film's conflict. This same attitude of holding the audience's hand through anything that might be difficult also extends to the female characters—who do little beyond being tools for their men—and the score—which occasionally shows promise (e.g. the choral sections) but is more often hamstrung by the film's need to keep its tone safe. These issues aren't enough to ruin the film for me entirely, and if this is the direction Hollywood is heading then I have nothing but hope for our future. Caesar's planet may be destined to become overrun with mutated monkeys, but ours shows signs of more visually creative cinematic experiences to come. Dawn of the Planet of the Apes had every opportunity of being derivative garbage—it's a sequel to a prequel reboot—but instead it pushes the limits of what visuals you can get from a big budget while keeping its focus on storytelling, and thereby shows us what real blockbusters can achieve.